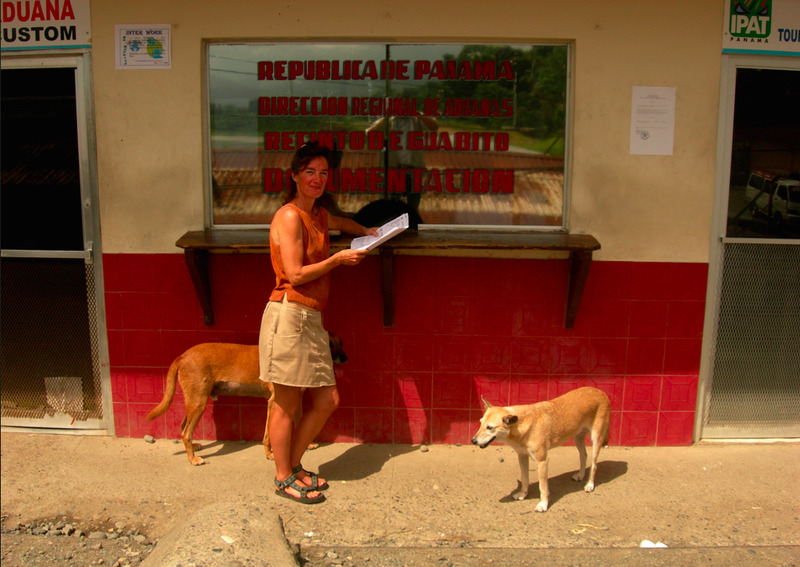 outside one of the Panamanian border control offices. 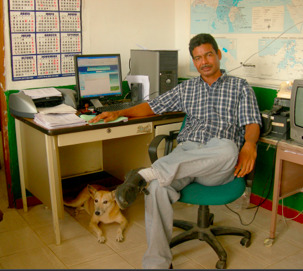 The agriculture office was air-conditioned and Dog immediately made herself at home underneath the officials desk. 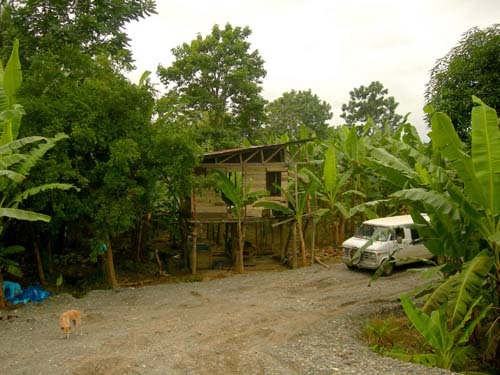 This area of the world is home to many, many banana plantations, this one owned by Dole. We camped here. I'm currently in Panama! I was ecstatic to only pay $200 in bribes to leave Costa Rica, as papers for both myself and the van were expired. The dogs, who I never take chances with, crossed the border effortlessly. I'm now making my way to Colon to ship the van to Colombia. I'll also be seeing if it's feasible to take myself and the dogs on a sailboat though I may have to resort to a flight as it's the rainy season. The cargo boat which takes the van leaves THIS FRIDAY! If you had wanted to help out by purchasing my book or any prints, this would be a great time to do so. I also have a NEW site, www.WorldWideBeasts.com which I'll tell you about in a few paragraphs. Though it may appear I embrace the passions of my life, the photographs and writings which mean the most to me remain largely unseen unless you subscribe to Fido Friendly, www.FidoFriendly.com, a magazine I've been writing for three years which is devoted to those traveling with their dogs. Now I'll be writing about my current adventures for a new magazine called Overland Journal at www.OverlandJournal.com, which is devoted to overland travel by vehicle. I'm ecstatic to be writing for both these publications right now, as previously I've had to mentally recreate my adventures sometimes years after they've happened. Now I'll be writing on my travels in South America as they unfold. I'll also be doing a five part series beginning January for the Australian magazine, Dog's Life. www.dogslife.com.au The subject will be dogs in Africa, one of my favorite topics. I've also launched a very important site, www.WorldWideBeasts.com to help pay for some of my travel expenses. Please take a look, have a chuckle and enjoy. Throughout my time in Kenya, America and Central America, amidst magazine assignments and book writing, I've consistently and methodically been photographing my own two dogs, Dog and Bruiser. It is now time to unveil this collection. The resulting photos are a cross between William Wegman's pictures of his Weimaraner dogs in various costumes and poses, and John Steinbeck's Travels with Charlie. In the pawprints of these great artists, I'm delighted to announce the unveiling of www.WorldWideBeasts.com, which will later be a book. I don't claim they're the most travelled dogs in the world as I'm sure those with private jets carry their dogs with them endlessly. But mine have certainly sniffed and marked more territory. With only rudimentary cross-cultural skills under their collars, my Kenyan canines have gone from Africa, to the California coast to the concrete jungles of New York City, and now further south into the America's. This site is especially important to me right now as Bruiser's had some health scares for the third time this year. And every time he's proved himself ready to fight another day. It's time to introduce him to you. For two weeks after leaving the fishing village, we stayed in Costa Rica's capital of San Jose, at the house of Judith, a friend from Cairo days. At the beginning and tail end of our time, Bruiser got ultra-sound scans done on his spleen. The scans showed two cysts or tumors. At ten years old, I'm reluctant for him to have the spleen removed. I had a hunch it could be stress related due to living in a village and being around teenage boys who were not always friendly. Our time in San Jose was stress-free, (thank you Judith!) I changed Bruiser's diet and added supplements. The day before we left another scan showed one of the cysts/tumors had gone. This tour of South America will include monthly visits to veterinarians across the continent for regular ultra-sound appointments to keep abreast of the situation. This will certainly be a different perspective on local culture! I don't think of myself as city person but being in a city after living on a beach for 13 months was initially invigorating and recuperative. It was like being in a mini-America. There was a Best Western and Denny's around the corner. On my first morning I had breakfast there with two women in their early sixies. They ordered the senior special and encouraged me to do the same. You have to be 55. I'm 47. The waiter didn't bat an eye. I was delighted... I think. After leaving Costa Rica we camped in a rain forest for two nights. 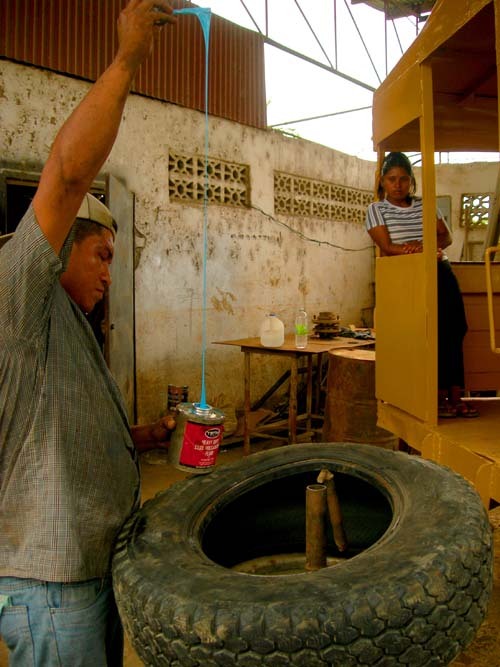 It's the most sparsely populated area of Panama and the only people who live here are indigenous. It rains a lot and we were holed up in the van much of the time. But after three intense days on the road the three of us were very happy to not having any more stimulation. I'm embarking on this next excursion in South America hoping to benefit from what I've learnt from previous camping experiences - perfection doesn't exist. This may seem obvious to many of you but it's something I've had to learn. In America, I observed that no matter where I camped, no matter how perfect it appeared, there was always some dark flaw. In Holly Head, Louisiana, there was an incredible beach which was legal to drive on with no other campers - it was also home to mosquitos that swarmed in droves as soon as the sun set. Desert wilderness in Arizona which had a refreshing trickle of water flowing, also had one rattlesnake a day making an appearance. In the Superstition and Sawtooth Mountains, weekend warriors toting Rambo-like guns and wearing protective covering over their ears would descend on paradise - I was in a war zone. I learnt every Garden of Eden has a snake. Sometimes it's to teach us tolerance. Other times, it's just best to move on! I hope I'm better at learning the difference. Thank you, and please check out my new site www.WorldWideBeasts.com! I will be adding more as the weeks progress. 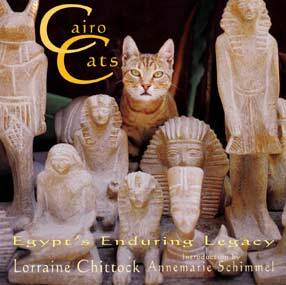 If you'd like to support my travels (or Bruiser) by buying a cat book, please go to www.CairoCats.com. And at the suggestion of a few people, I've added a donation button at www.WorldWideBeasts.com for those who like what I'm doing but are not animal people. Also for non-animal people are scenic prints at www.LorraineChittock.com. I'm most grateful for all your purchases!